The MA3800HD 1800W Digital Echo Mixing Amplifier with HDMI, High Definition output on both Video & Audio, which produces the highest and best sound quality. Plus, there is a mixed output ( Music and Vocal), from this one, you can connect it with a TV input, so that no matter what source you select, you can hear it from the TV speaker. (Treble) /- 15 dB @ 12 KHz. (Treble) /- 15 dB @ 10 KHz. (Bass) /- 15 dB @ 80 Hz. (Bass) /- 15dB @ 80 Hz. (Bass) /- 15 dB @ 100 Hz. Power Consumption AC 115/230V, 60Hz. One Video Input. Two Audio Inputs and One USB/SD Card MP3 Data Interface. MA3000KII 750W Max Power with a built-in SD/USB readers to playback MP3 songs Function with Subwoofer output. MA3000KII is the hottest and the newest digital mixing amplifier! Max power of 750W 750W yields the best quality sound that you can experience. I try to describe each item to the best of my ability. I will not respond. Designed by German engineers, Martin Roland is known for its quality and durability. 960W (480W 480W) Maximum Power Output @ 4 Ohms. Essentially purchasing a system you would never fully utilize. This amplifier will bring optimum sound to your party! Echo, Delay, Bass & Treble Microphone Mixing. Better Music Builder (M) DX-333 G3 700W. New model 2018. Power Output: Peak 700W; RMS 300W (1kHz, 8 ohm); Peak 960W; RMS 400W (1kHz, 4 ohm). Although the amplifier is powerful, its size was not compromised. The BMB DAH-100 High Performance Digital Karaoke Amplifier designed in Japan to bring premium BMB sound quality into your living room. Bluetooth lets you connect your smartphone or tablets and play your music with excellent stereo sound. The Pyle PMXAKB2000 karaoke mixer features Bluetooth wireless streaming from your device. The amplifier produces a powerful 2000 watts (1000W 1000W at 4 Ohms) of power and the mixer features two microphone inputs, two line inputs and two video I/O connections. IDOL PRO IP-3688 PROFESSIONAL KARAOKE MIXING AMPLIFIER. FOR SALE IS A NICE IDOL PRO IO-3688 KARAOKE MIXING AMPLIFIER. UNIT WAS TESTED AND WORKS FINE. NO MIC IS INCLUDED. IDOLpro IP-3800 1300W PROFESSIONAL KARAOKE MIXING AMPLIFIER. Digital Echo: Up To 300ms. Noise Ratio: >90dB. Digital Sound Effect. Noise Ratio: >85dB. Power Output (Peak) : 650W 650W @ 8Ω. Built-in MP3 Player Module. The MA-940 Mixing Amplifier features 5D technology. Net Weight: 32 Lbs / 14.5 Kg. UPC Code: 743062980698. Power Consumption: 120V 60Hz, <1300Watts. Static Power Consumption: 35 Watts. Output Impedance: 4~16 ohm. The world of karaoke is changing with the PMA-1200 Mixing Amplifier. Sing from your Smart TV by easily connecting to the built in digital optical input of the PMA-1200. No problem. This unit has strong Bluetooth range so you can stream audio from any smart device. The DX-388 D Mixing Amplifier features 5-D technology like our DX-388 Beta. 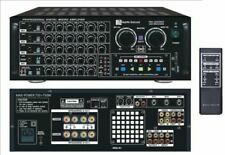 With new 388 Series every year, our goal is to enhance the user’s experience; we focus on audio quality, system features, compatibility and compact size. Powerful amplifier with built in Karaoke Mixer and Equalizer. One solution for all your singing needs. Brilliant digital screen to display your input signal. 800W Karaoke Mixing Amplifier. 10 Band Equalizer. KOK Audio MXA-202. 1000 WATT KARAOKE MIXING AMPLIFIER. Pre Output: In/Out RCA Jack for Equalizer. Mic Output: Scoring for Midi Karaoke. They have accumulated more years of experience in designing the best sound and the most durable amplifier than any other karaoke amplifier manufacturer in the market. This design allow users to enjoy the latest karaoke technology to be released in the future from BMB without buying a new amplifier. DSP (Digital Signal Processing) technology customized by Better Music Builder. Music “Mute” allows the microphone to be active while the music is off. 5-D PRO Audio 900 Watts Max Power. 3/5 1 (subwoofer) audio distributions. 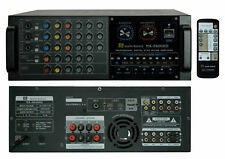 Powerful 1500 watt, 4 channel karaoke mixing amplifier, with built in HDMI, Recording & Bluetooth. LED Graphic Spectrum Equalizer Display Different Style. DSP Digital Sound Processor. Digital Echo:Up to 300ms. Noise Ratio: >85dB. Microphone Frequency Response: 20Hz - 20 kHz / 3dB. T.H.D : <0.5%. Microphone Input Sensitivity: 10mV. IDOLpro IP-3800 1300W PROFESSIONAL KARAOKE MIXING AMPLIFIER. Digital Echo: Up To 300ms. Noise Ratio: >90dB. Digital Sound Effect. Noise Ratio: >85dB. Frequency Response: 20Hz - 15KHz -3dB. T.H.D. : <0.5%. Amplifier Output: (1KHz,-3db,6ohm): 0.03%. 4 video input / 3 video output. 5 mic input (3-Front/2-Back). Input Sensitivity / Impedance Video Input Sensitivity/Impedance: 1Vp-p/75ohm. MUSIC: 10Hz to 40kHz, /-3dB.